Halfway through the month of August, and I am still in the kitchen cooking. Haven't used the grill in weeks. What is wrong with me? I guess that the air conditioned house is just too comfortable and I am in the mood for spring rolls anyway. Place 2 Tbsp. oil in a wok or large frying pan over medium to high heat. Add garlic, galangal (or ginger), green onion, and chili. Stir-fry until fragrant (about 1 minute). Stir-frying Tip: Add a little water to the wok/pan when it gets too dry instead of more oil. Add cabbage, mushrooms, and shrimp. As you stir-fry, add the sauce. Stir-fry 1-2 minutes, until vegetables have softened. Do a taste test for salt, adding 1 Tbsp. more fish or soy sauce if not salty enough. To assemble rolls, place a spring roll wrapper on a clean working surface. Place one heaping Tbsp. of the filling on the wrapper (if using large wrappers, you will need more). Tips: Spread the filling lengthwise along the spring roll wrapper nearer the end closest to you. Also, try not to include too much of the liquid left in the bottom of your wok/pan (a slotted spoon works well for this - drier filling is better. Fold the left and right sides of wrapper over filling, then lift up the wide end nearest you and tuck overtop. Roll to the other end. Secure the roll by dipping your fingers in some water and wetting the end, "pasting" it shut. 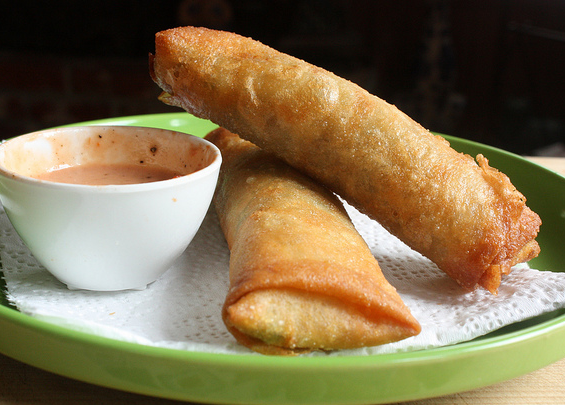 To fry spring rolls, place some oil (about 1 inch deep) in a wok or deep-sided frying pan over medium-high heat. When bubbles rise, or when the oil begins to form snake-like lines across the bottom of the pan, the oil may be hot enough. To test it, dip one corner of a spring roll into the oil. If it beginsto sizzle and cook, the oil is ready. If not, wait another 30 seconds to one minute and try again. This recipe makes 12 spring rolls. You might want to double the recipe if you have a big family!